Welcome to the newest member of the Wyman Institute’s Academic Council, Prof. Arthur Hertzberg. As a rabbi, author, historian, and Jewish leader, Arthur Hertzberg has been one of the most distinguished figures in the American Jewish community for nearly half a century.Educated at Johns Hopkins University (B.A., 1940), the Jewish Theological Seminary (ord. 1943), and Columbia University (Ph.D., 1966), his academic career has included serving as a professor of history, religion, and Jewish studies at Columbia, Rutgers, Princeton, Hebrew University, Dartmouth, and, currently, New York University, where he is Bronfman Visiting Professor of the Humanities. Prof. Hertzberg’s many books include The Zionist Idea (1959), The French Enlightenment and the Jews (1968), Being Jewish in America (1979), The Jews in America (1989), The Fate of Zionism (2003), and his recent autobiography, A Jew in America, which won the 2003 National Jewish Book Award. 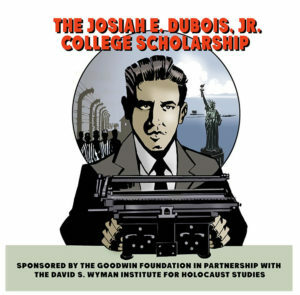 A Wyman Institute conference, “America and the Holocaust: New Questions, New Perspectives,” will be held at Boston University, on Sunday, November 14, 2004. The event will be hosted by Prof. Steven T. Katz, director of the university’s Elie Wiesel Center for Judaic Studies and a member of the Wyman Institute’s Academic Council. More details about the conference will be announced shortly. Ellen Adler, a member of the Wyman Institute’s Arts & Letters Council, was interviewed by The Forward on July 9, 2004, concerning the late Marlon Brando, her close friend and student of her mother, the famous actress and acting coach Stella Adler. Ellen recalled Brando’s role in the 1946 Ben Hecht play “A Flag is Born,” concerning Holocaust survivors and the struggle for Jewish statehood. Thane Rosenbaum, scholar and novelist (and member of the Wyman Institute’s Arts & Letters Council), has authored a new book, The Myth of Moral Justice: Why Our Legal System Fails to Do What’s Right (published by HarperCollins). It was reviewed in the New York Times on May 2 and the Washington Post on July 22. A letter by Thane, concerning the writings of children of Holocaust survivors, appeared in the July 25 issue of The New Republic. His essay on the controversy over Swiss banks holding funds belonging to Holocaust victims appeared on the front page of the New York Jewish Week on May 7. Wyman Institute director Dr. Rafael Medoff authored an op-ed in the Jerusalem Post on July 8, 2004, concerning Benjamin Akzin, the Israeli scholar who during the 1940s worked in the U.S. government and was the first to propose that the Allies bomb Auschwitz. Dr. Medoff also published letters in the Chronicle of Higher Education (concerning the issue of when Americans became aware of the Nazi genocide) and the Jewish Weekly of Northern California (concerning the response of leading British clergymen to the Holocaust). A July 22 article in the Jerusalem Post described “Operation Last Chance,” the campaign to capture Nazi war criminals launched by Dr. Efraim Zuroff, director of the Simon Wiesenthal Center in Jerusalem (and member of the Wyman Institute’s Academic Council). The campaign offers a $10,000 reward for information leading to the prosecution and punishment of a Nazi war criminal. In the first three weeks since the campaign was introduced in Croatia, the Wiesenthal Center has received sufficient information to prepare a fully documented case against Milivoj Asner, a notorious police chief suspected of war crimes in northern Croatia during the Holocaust. “Operation Last Chance” was previously introduced in Lithuania, Latvia, Estonia, Poland, Romania, Austria, and Hungary, and will soon be extended to Argentina. Since the campaign was launched in 2002, the names of 296 Nazi suspects have been accumulated, 73 of which have been submitted to local prosecutors, resulting in the opening of 19 murder investigations.